I wouldn't call myself a tea-drinker. I imagine there's something soothing and cathartic about bouncing that little bag of herbs up and down in a steaming mug of water, but the flavors I've tried have never really done anything for me. That said, I shamelessly confess to being obsessed with chai tea. I first discovered it when I was a barista at a Barnes and Noble cafe (proudly serving Starbucks beverages since 1993! ), and I've loved it ever since. Yes, I like it even more than the sinfully decadent white chocolate mocha. If you predicted that I used a recipe from Martha's book, you get 30 points and a cookie. I did make it my own, however, by filling it with dulce de leche (which, for the record, was quickly absorbed by the cupcake and left a giant hole in the cupcake...doh!) and topping it with a cinnamon-tinged buttercream frosting. Even though the caramel seeped into the cupcake, the flavor was still there and delicious. The only thing affected was the appearance--I suppose a cone-shaped crater can be a bit off-putting. This is a great cupcake. I'm feeling generous today--62 points for Martha and her team (but no cookies!). Bring milk to a simmer over medium heat. Remove from heat; add tea bags, and let steep, covered, 15 minutes. Remove tea bags, squeezing the bags over the pan, and discard. Allow milk to cool completely. Whisk together both flours, baking powder, salt, pepper and spices. With an electric mixer on medium-high speed, cream butter and brown sugar until pale and fluffy. Add eggs, one at a time, beating until each is incorporated, scraping sides of bowl as needed. Reduce speed to low. Add flour mixture in three batches, alternating with two additions of tea-infused milk, and beating until just combined after each. Divide batter evenly among lined cups, filling each three-quarters full. Bake, rotating tins halfway through, until tops spring back when lightly touched and are pale golden, 10-12 minutes. Turn out onto wire racks to cool completely. To make the frosting, beat the butter with an electric mixer for a few minutes. Add the cinnamon and milk and briefly blend. Add the powdered sugar gradually until the frosting is thick enough to spread easily. If the frosting is too dry, add additional milk until the desired consistency is reached. To fill the cupcakes, carve out a cone-shaped hole (forget donut holes--I'm marketing cake holes!) and carefully spoon the dulce de leche inside. Apply frosting generously to cupcakes and, after giving the components a few minutes to get to know each other, devour. Wonderful! Chai tea tastes amazing. Your cupcakes must be divinely spicy. I would look past the hole and just enjoy what looks like a gooey, wonderful cupcake. I love the addition of the dulche de leche, must've been amazing with the chai flavours. I love chai tea!! I bet these are amazing! I'm betting these cupcakes taste amazing. Love the chai tea flavor; and dulce de leche elevates any thing in my book, crater or not. Great job Grace! Chai is one of my favorite teas and I bet it's amazing in these cupcakes! The dulce de leche was a great addition -- I don't mind a crater in it if a cupcake tastes this delicious! I have a vague memory of making a chai baked good. I went and checked my blog, and it was Chai Biscotti, for a cinnamon event that you hosted! Wonderful cupcakes.. love chai in it. I think you are aware I QUITE like tea. I am all over these. Do you think if I froze the caramel stuff, it would stay inside and not be absorbed? I love dulce de leche!! !These cupcakes look amazing! 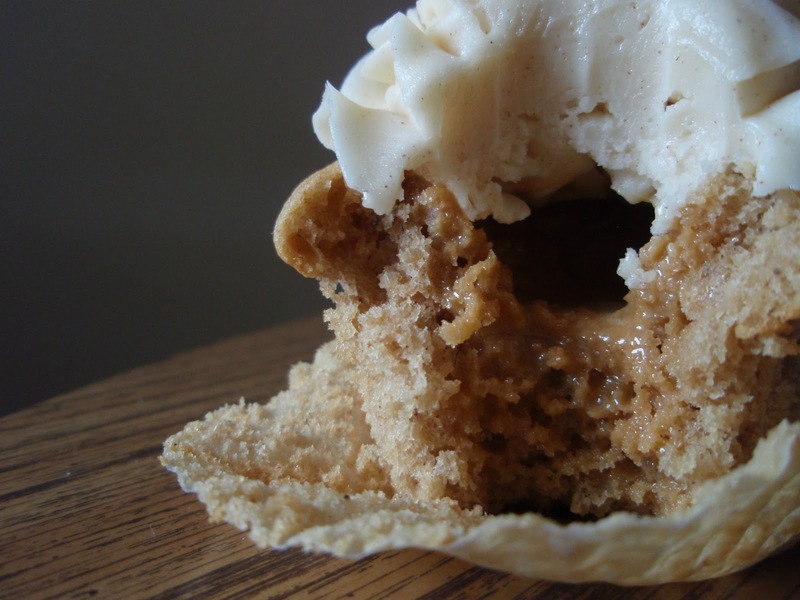 Try, instead of coning the center of the cupcake, using a piping nozzle and piping bag to squirt the dulce de leche in without cutting any cupcake out. It'll soak in, and you'll still have a nice fat cupcake! I'm a coffee drinker myself, Grace. However, afternoon tea has become a ritual around here since Marion arrived and I must say, I rather like the "bouncing" tea bag:) My first experience with chai is recent and I just fell in love with it. Black coffee for me, and lots of it, but I would love to have one of the cupcakes along with it. Oh my this look amazing! I love chai tea, and ALL tea really. Btw - your inside out pineapple cup cake sounds sensational! I go through phases with tea, but I've always loved chai. It's all those spices...they're intoxicating. I'm sure even more so in cupcake form. They look awesome - caramel hole and all! I love S'bucks Chai - it's probably my favorite sweet drink there. It's definitely the spices and they are captured very well in this cupcake. The cardamom makes it for me:-). I like Tazo and TJ's chai tea. Not the sweet flavor, but you get the nice spices. This is a cool cupcake! I've fallen victim to the caramel hole in baking as well. Why can't it just stay there darn it! It certainly doesn't affect the flavor though and chai with caramel sounds perfectly heavenly to me. I'm not a tea drinker, but that center has totally drawn me in!! I love tea in the baked goods too. The cupcake looks really super, esp. the cinnamon buttercream. So with the hole there.... are there less calories? I kind of like the hole, it looks so ooey and gooey. Thanks for not using a cream cheese icing! However.....the thing that caught me was dulce de leche. My downfall. These sound wonderful! Crater or not, I know I'd love them. I'm addicted to Starbucks Chai Latte. Yummy cupcake. Wow! I love chai tea - these cupcakes are so creative and look sooo good! I have chai every afternoon- totally love it. I like Stash brand the best. Somehow I've never had chai tea--why not, I have no idea. I certainly would go for one of these cupcakes though, crater or no. Interesting that the dulce de leche disappeared into the cake. Good to know! Love the thought of chai flavors in a cupcake. Can I have a cup of tea on the side too? You had me at chai.... oh. my. I love chai so you can imagine how much I would love these little beauties. YUM! Chai is one of my many weakness!! I know I would love these ... but no sharing! Love Chai!! Love it so much, these look divine! Ohhh...mi querida Grace es una tentación estupenda ,me encantaría dar un mordiscón,abrazos hugs,hugs. 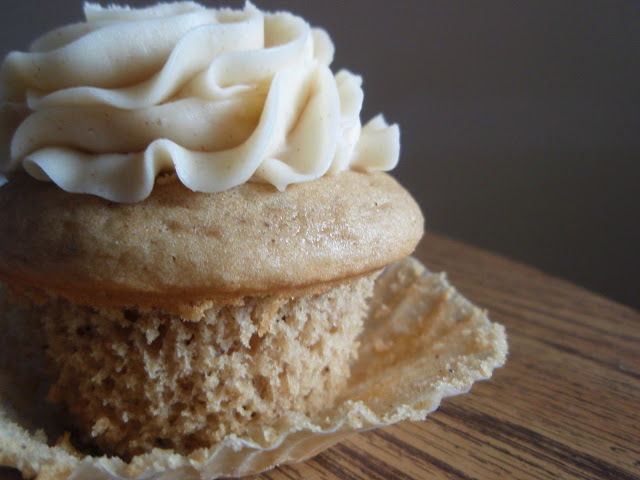 These chai tea cupcakes look divine. Awesome. Looks sooo good. I'd probably just fill the hole with extra buttercream!